Let’s share insight and practical ideas. Let’s blend fun with function, and LET’S USE THE POWER OF A CHILD’S ASSOCIATION WITH DELICIOUS TREATS TO TEACH! 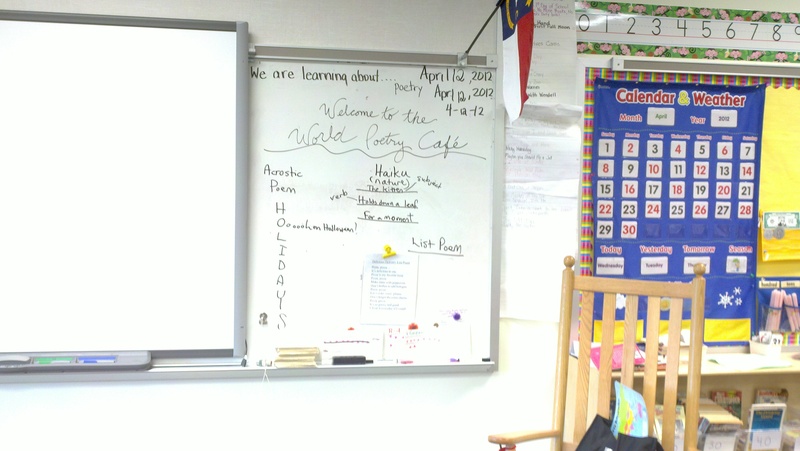 OPEN UP A POETRY CAFE complete with a Menu Board, like you see in my blog pic here, and invite your students to MAKE NO-BAKE RHYME TIME CUPCAKES. Even though kids know that the Poetry Cafe is a writing activity, my experience is testimony to how excited they’ll be with this opportunity. Opening up a Poetry Cafe kitchen where students are the master chefs puts the power of associative learning to work…the children will be eager to (pretend) to bake up rhyme-time cupcakes because they love to eat the real kind! You can sense how intent the kids are in my blog pic below. I’ve given out sheets of pre-printed cupcakes (cupcake shapes are available in teacher supply stores; I glued six cupcakes onto a piece of copy paper to make my master). These children have written their rhymes and cut out the cupcakes. Now they’re coloring the seasonal decorations on the frosting. Tell your class that you have a recipe with a sequence of steps for them to follow (see below) to make their No-Bake Rhyme-Time Cupcakes. Post the steps on the “menu” board along with examples of rhyming lines that connect with the current season. Your examples will help kids “jump-start” their own rhymes. 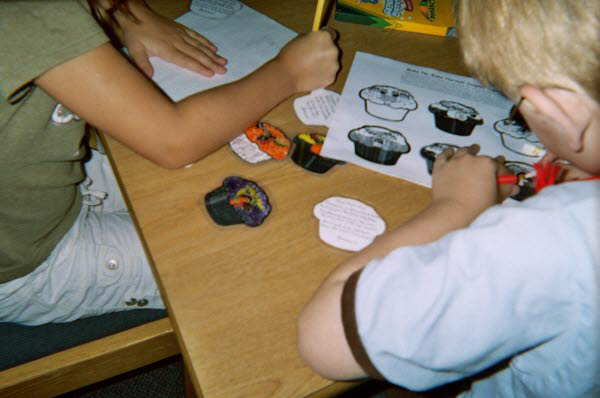 Depending on your grade level, encourage less or more lines for the cupcake poems, keeping in mind that the finished poems need to fit inside the cupcake shapes. My rhymes below suit children in grades 2 – 3 and may serve as brainstorming aids for students in grades 4 – 5. Choose the season that’s best for your community at the time of year you use this activity. Set cupcake sheet aside. Use notebook paper for either copying your choice of seasonal rhymes from the “menu” board or making up your own rhyming lines. Write at least two lines (poetic term: couplet). 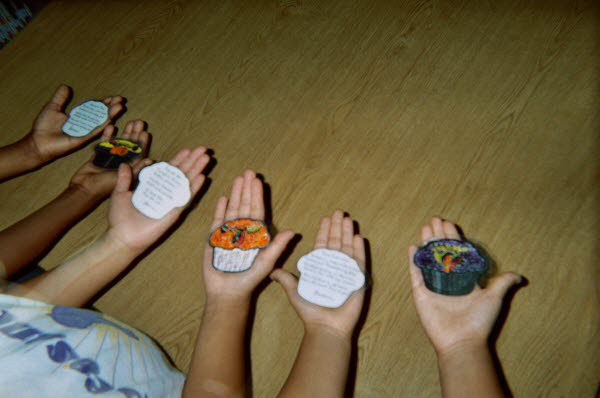 May write as many as three couplets to complete a poem that will fit, in small print, on one side of a cupcake shape. Re-read and revise, as necessary, to finish rhymes. Hold up cupcake sheet to the light to see through to the blank (un-decorated) side to see where to re-write the finished rhymes. Mark where to write the rhymes; rewrite them on the blank side of the cupcake sheet. Color the cupcakes on the front side with seasonal decorations, like pumpkins for fall, etc. Cut out each cupcake shape to finish the activity. Optional for teachers: laminate the finished cupcake rhymes and post them on a Poetry Cafe Bulletin Board. These rhyme-time cupcakes look almost good enough to eat! Using the power of associative learning is an effective strategy for catching and keeping K – 5 kids’ attention. The children showing their finished Rhyme-Time Cupcakes in my blog pic here spent a solid thirty minutes working on them. They were so excited with their finished cupcakes. Get your class cookin’! ‹ Will You? Won’t You?